Trailhead and parking area are on Willey House Station Road in Harts Location, NH (summit is in Bethlehem). This road leaves Rt. 302 12.2 miles south of Rt. 3 and 16.8 miles west and north of Rt. 16. The parking area is 0.3 miles up the road. Willey House Station Road is marked with a sign for Ripley Falls. Mt. Willey is the southernmost mountain in the Willey Range, and although it lends its name to the range, it is not the highest peak. Most would agree, however, that it has the finest view in the range. Two spectacular viewpoints are found near the summit: one to the east, looking up to the Presidential Range and over Crawford Notch; and one to the west, overlooking the eastern Pemigewasset Wilderness and the Twin Range. The hike begins on the Ethan Pond Trail. The trail climbs to and crosses the tracks of the Conway Scenic Railroad, from which there is a slight view up toward your destination. It then climbs moderately 0.2 miles to Arethusa-Ripley Falls Trail; bear right to stay on Ethan Pond Trail. If you have time, venture 0.3 miles down Arethusa-Ripley Falls Trail to see Ripley Falls, a worthwhile detour. The main trail then makes a steep, steady climb up a very long dirt-and-log staircase. The trail eventually moderates and traverses easier terrain for a while. After a mile, pass Kedron Flume Trail on the right. Continue 0.3 miles, then bear right onto Willey Range Trail. The trail quickly crosses Kedron Brook. Winding to the left, it crosses two smaller brooks, then turns to face the incline. The trail surface becomes gravelly, and the climbing begins. It quickly becomes very steep. There are a few rock scrambles mixed with tedious hiking over loose rock. Halfway into the climb, the trail navigates a rock climb on a set of ten low-angle wooden ladders. At the top of these ladders, there is a small view to Mt. Crawford and Mt. Resolution. The climb continues over less gravelly footing until reaching a brief flat area near a blowdown clearing. The trail again becomes steep for the last part of the hike; more rock scrambles are still to come. After 0.7 miles of climbing, the trail eases just below the summit, where a sign on the right points the way to the best viewpoint on the mountain. This near-summit ledge provides a fabulous view to the Presidential Range, best seen when standing. Most spectacular are the dramatic Webster Cliffs on the other side of the notch. The Montalban Ridge in the Presidential Range-Dry River Wilderness can be seen over the cliffs, and the Baldface Range and mountains near Conway can be seen above that. Mt. Tremont, Bear Mountain, Table Mountain, and the Moats are seen through Crawford Notch. The Sandwich Range is visible behind Mts. Nancy and Bemis. All the way to right is Mt. Carrigain. 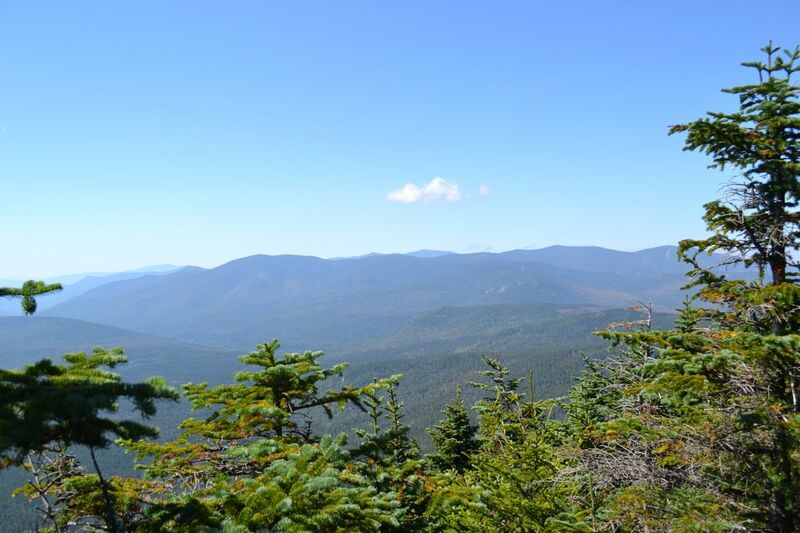 After enjoying the spectacular views here, continue over the summit and descend a short distance to a less open view over the Pemigewasset Wilderness. Mt. Carrigain and Mt. Hancock are to the south, while the magnificent Bonds rise above the flat land in the eastern wilderness. The lofty Franconia Ridge looms above Mt. Guyot. Zealand Mountain is seen below the Twins off to the north.